Our coffee freezing process makes use of the latest impingement technology to deliver a number of advantages compared with previous methods. The coffee freezer also enables smooth, temperature-controlled freezing to maintain the colour and flavour of the coffee. The fact that the belt can be processed in an endless loop – in widths up to 2250 mm (88.58 in.) – means that production is both continuous and highly efficient. 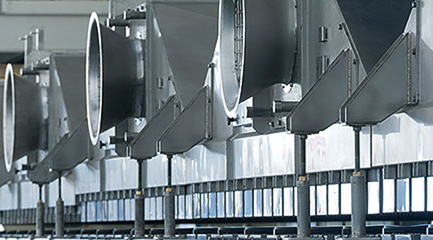 The use of a steel belt means that the freezing system can be operated at low temperatures (down to –50ºC/–58ºF) while also accommodating the need for fluctuating temperatures to allow for freezing and defrosting cycles. The smooth, joint-free surface of the steel belt ensures maximum hygiene and makes products slide smoothly and cleanly from the end of the belt. Recent years have seen all the world’s major instant coffee producers install IPCO systems, reflecting the fact that freezing has proved the optimum process in terms of efficiency and product quality. The impingement technology and expertize behind our coffee freezing system also has applications in other areas including the freezing of whole fish, fish fillets, crabs, scallops and shrimps. Contact us for advice on product selection or other technical support.